Can you imagine weaving in a place where you have access to fully-stocked shelves of colors and fibers? Or, imagine someone with excellent color sense setting up a warp-faced project for you to weave, giving you the freedom to simply focus on pattern. This is what it was like at Vävstuga Weaving School for More Swedish Classics. 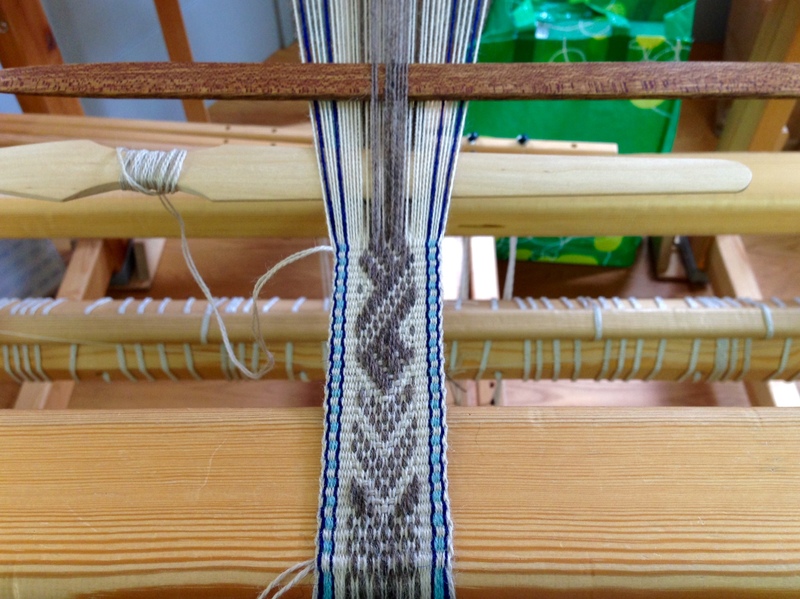 Set up on a four-shaft loom, band weaving with pick-up is simplified (or complicated, depending on how you see it). Five treadles are used to raise and lower threads. 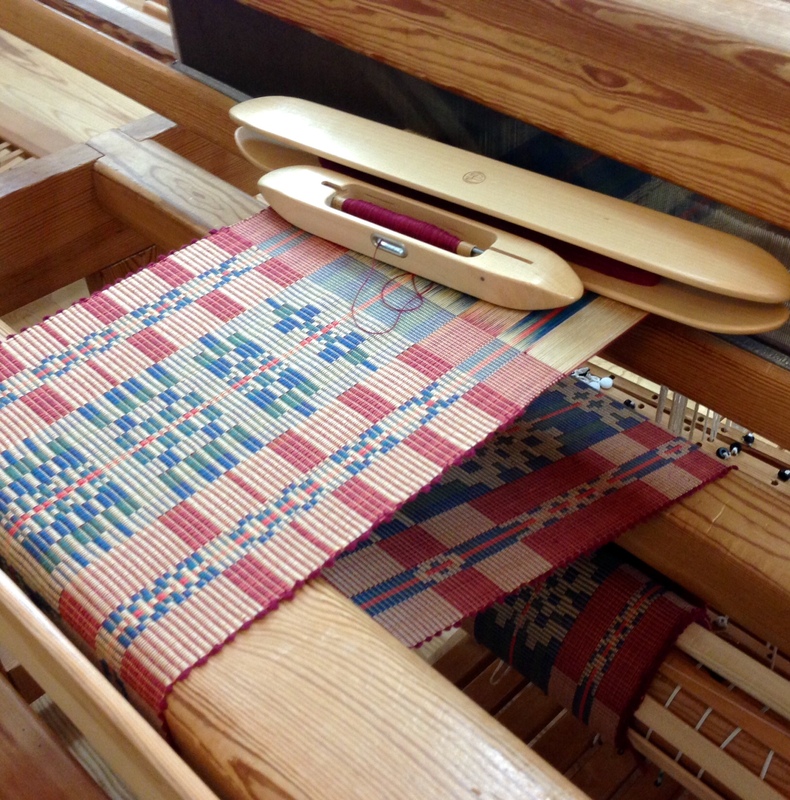 A pick-up stick is used to lift pattern threads, and a band shuttle stick is used to beat in the weft. Being a warp-faced weave, all the color is in the warp, and the weft is mostly hidden. Becky’s Rep Weave in Four Blocks on Eight Shafts. I took this opportunity to experiment with patterns. You might call this “playing with blocks.” Again, being a warp-faced weave, the color is pre-determined by the arrangement of the warp ends. The thin 16/2 cotton weft alternates with a thick weft of mini string yarn, giving the characteristic ribbed surface. Worry happens when I don’t think I have what it takes to do the job, or when I think I won’t have enough of what I need. When Becky Ashenden prepares the warp, I certainly have no worries about choosing colors. And, with an abundant supply of 16/1 linen, I can combine three shades to produce a gorgeous, rich red, with no fear that the color supply will run out before I finish. 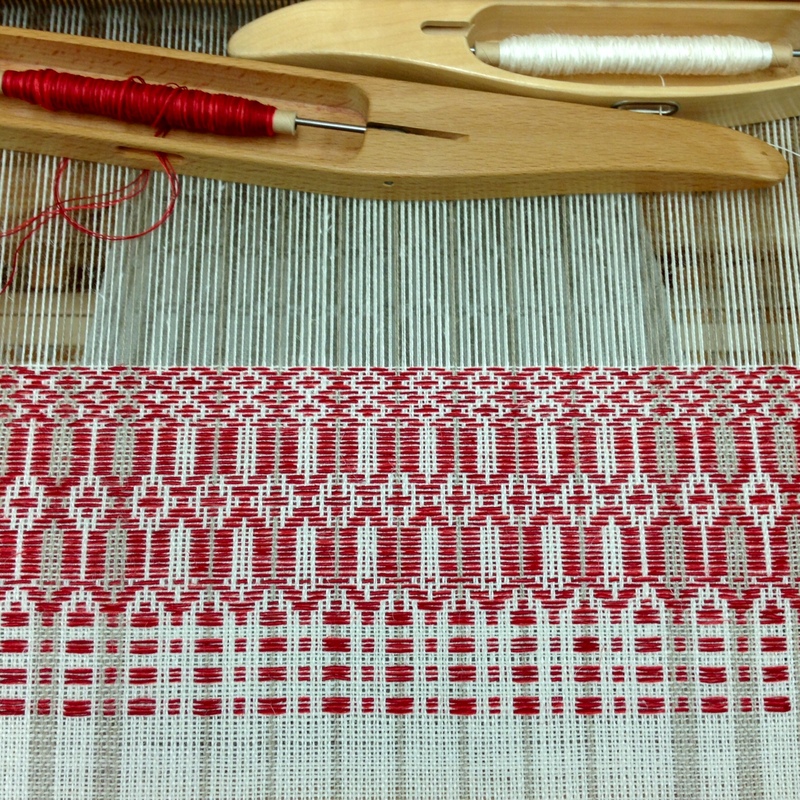 Deep red, burgundy, and coral 16/1 linen are wound together for the pattern weft in Smålandsväv. The warp is 16/2 line linen. This is the project in “More Swedish Classics” that gave me the most pleasure AND the most angst. …but that’s a story for another day. We have a Father in heaven who knows all the things we need. All he asks is that we get to know him so we can learn to do things his way. It is much like weaving within the guidelines of the studio where we’ve been given the privilege to weave. Is that too much to ask? For his part, then, he sees to it that we have everything we need, giving us access, through his Son, to his great supply closet. May your needs be amply supplied. Wonderful photos and am jealous of your being able to go to the V studio. Where might I find the instructions for band weaving on a 4s loom. Thanks. Hi Helen, I wish everyone could go to Vavstuga with me! Maybe you can go sometime. This is my first experience with band weaving on a 4 shaft loom. I’m not at liberty to hand out Becky’s instructions for the class. I’m not sure where else to find instructions for this. I do know that the Baltic patterns in Anne Dixon’s “Inkle Pattern Directory,” pgs.61-81, can be used for this type of set up. We used 4 shafts and 5 treadles; 1 of the treadles just lifted the pattern threads, and then we used the pick-up stick to create the pattern. I followed you the next week at More Classics. Amazing. (I was at Basics with Steph.) Your voice for this experience is perfect. How exciting! It’s always fun to have shared experiences with other weavers. I agree – it was an amazing class!